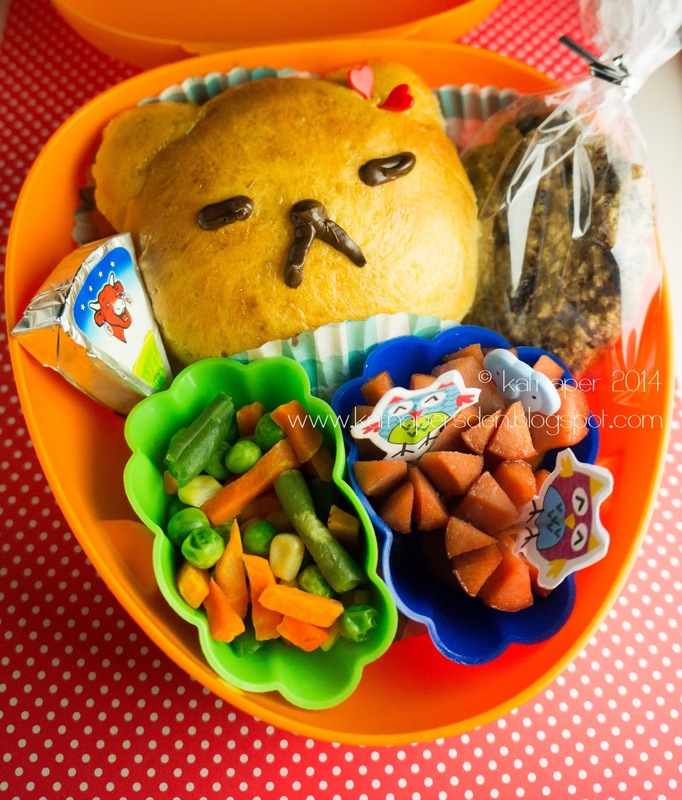 katnaper's den: Bento #20: Rilakkuma? So I tried my hand at baking Rilakkuma bread using a milk bread recipe I found off a Japanese cooking site. I thought my grasp of bread making was reliable enough to be able to work out the recipe since the ingredients were pretty basic and well... I was wrong! Most of them turned out flat instead of fluffy and I think my oven is too hot since most of the bottom was burned. Like I tweeted, the bear looked like roadkill hu hu hu. Now, I hate wasting things so I tried to salvage what I could. The Kiddo's lunch shows the part I salvaged. I cut off the burned bottom parts and used the tops to make a Wow Butter sandwich. I used melted chocolate to create the bear's face and used food picks to create the 'ribbon' because she's a girl bear. I also packed Kiddo a cookie, sausages and mixed veggies and cheese. Kiddo said she liked the bear so much she wanted me to make some more. I'll post Rilakkuma v.2 next time.